I love fashion weeks. They are crazy and chaotic and mean long hours spent before and in between shows. But the energy at the venue with all the fashionable people in one place and of course the gorgeous clothes, both on and off the ramp, make it all worth it. I knew it was going to be a long day, so the focus of my makeup was to prep the skin so it would hold the entire day. A good primer and fixing spray were definitely a must for looking fresh throughout the whole day. Already anticipating the long hours, I've planned my Digital Fashion Week outfits to be both comfortable and stylish. First day shows always begin fashionably late, heightening the anticipation and expectations of the opening show. This year's opening was Max Tan, featuring the world’s oldest model Carmen Dell’Orefice. The wait was truly worth it. Max Tan’s collection was a mix of sculptural silhouettes and fluid lines in his signature monochrome palette. A welcome surprise was the use of colours in this collection as Carmen Dell’Orefice walked down the runway in a shocking pink coat. I wanted almost all the pieces from the In Good Company's Capsule 5 collection that showed that day. The easy-to-wear separates in breathable fabrics are definitely on my to-buy list. I was particularly excited for day three. Not only were we going to watch the Pauline Ning and Depression shows, but we were also filming a video that would see us getting makeovers before the shows. Our ambassadors Crystal Phuong and Fenny Yolanda would be joining me. This was my first go at hosting and interviewing on camera and it was scary and exhilarating at the same time! We got makeovers courtesy The Body Shop and Cleo International Salon, using Label M products before going on camera. It all felt very professional: the makeup artist decided to go with a soft smoky eye and a tint of colour on the lips to complement what I was wearing. When it came to hair we decided to go with a half up half down style that was trendy and highlighted my features. Click here to watch us getting ready for Digital Fashion Week, Day 3. Once we were ready, we headed straight to Pauline Ning's show. The Singaporean designer's collection was inspired by luxe sportswear but also paid tribute to timeless fashion with its sleek cuts and classic silhouettes. Depression’s Inner Demons collection was true to the designer duo’s Goth style; but this time, the clothes had a more street-style twist to them. And while Depression usually designs menswear than can potentially be worn by women, this collection had outfits specially designed for their female fans. I won’t lie, the fatigue was beginning to set in by the time Day 4 arrived, but I couldn’t miss the Cristiano Burani and Fyodor Golan shows. For the last day, I switched up my look and went with a simple slick of liner and a bold lip. I also chose a structured top and slouchy pants that were versatile enough to take me from office to fashion week with just a change of shoes. Cristiano Burani’s show was a flurry of checks, pleats and pastels that made it perfect for summer. A completely wearable collection that was the epitome of casual cool. Fyodor Golan showcased a vivid and playful collection that featured feminine silhouettes in a riot of colours – playful and eccentric. The perfect ending to fashion week. I always find that the last days of fashion weeks are always bitter sweet: all of a sudden, you find that hanging out between shows isn’t such a chore any more because everyone has gone from being initial strangers to acquaintances and even close friends. There's just something about mingling in a space abuzz with fashion inspiration that makes the space familiar and comforting, a feeling that is sadly coupled with knowing that today will be the last day to be dazzled by the fashion on the runway. Bitter-sweet. But there’s always next year. Till then! However cliché it may sound, fashion and fashion (yes, another fashion) are the two things that I have been always interested since I was a child. It is through fashion that I am able to express my creativity, convey my emotions, and communicate my creativeness to the world. So being at this season's Philippine Fashion Week was an amazing experience for me. For the fashion-obsessed, experiencing the show is important as it gives you a deeper insight into the whole story of the collection and the concept that the designer had envisioned. It was definitely more intense and more personal than just going through pictures online or seeing the clothes on store racks. I was so blessed that I was given a Media Passes, it was a “Golden Ticket” according to a blogger friend I met online. I got to experience being ushered and sitting on the 3rd row and even standing at the last row from the last show due to its jam-packed audiences. 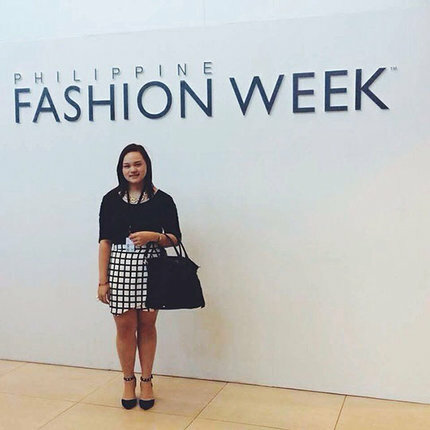 The first day at Philippine Fashion Week felt a lot like going back to school. There was the issue of choosing outfits for all three days! Believe me, I had a hard time packing my things and deciding on what outfit to wear or to bring. I researched a little and envisioned what the other attendees would be wearing. I thought that that would be enough for Day 1, but when I got there, I was overwhelmed! The venue was filled with fashionistas, some are wearing boots and hats, black lipstick, and other weird things that I know I may not have enough confidence to to wear. They were all a joy to watch and were such an inspiration that kept me going throughout the 3 day event. Overall, I found that all the collections that were showcased throughout the 3 day event were spectacular and amazing. It was quite exciting how global brands like Forever 21, Uno de 50, Suiteblanco and Sfera, kick-started PhFW with their show stopping latest collections. Forever 21 presented its latest and strongest offering: tartan and plaid pieces that harked to classic Brit Street style; clean, layered, and sartorial prep with University Chic; a capsule series of cutesy pieces for fashionable little girls; New Bohemian effortlessness via prints, ponchos, and leather jackets; and sleek updated work wear in concrete shades of Modern Monochrome. Sfera revealed this season freshest colours, and showed how easy it is to mix colours. Their ensembles also showcased easy and effortless silhouettes that played with texture to keep it interesting, with pieces like tweed trousers, a white wool bomber jacket, and a bulky black-and-white knit poncho. Uno de 50 showcased finely handcrafted jewellery collection while Suiteblanco exhibited free spirit in modern and contemporary silhouettes in its latest collection, transforming timeless feminine pieces into must-haves for this season. Designer brands like EsAc: Jun Jun Cambe, Lyle Ibanez, and Audie Ae, Jerome Salaya Ang, Jeffrey Rogador and Sidney Perez Sio were showcased during 2nd day followed by MEGA x H&M party. On the 3rd day, Human (with collaboration from Filipino designer Johann Manas from the Tokyo based label Jman) kick-started the show followed by Kashieca’s much-talked about Little Black Dress Collection, where top female designers Bea Samson, Vania Romoff, Sassa Jimenez, Milka Quin, Maureen Disini made their own versions of the perfect LBD. Each dress was styled and showed in four different ways to highlight their wearability and versatility for any girl. My favourites are Jeffrey Rogador’s JPNY collections as he brought to the runways his contemporary Pinoy pop-culture inspired looks and brought Philippine street fashion up a notch; and the “Svelte” collections of Cherry Veric and his dramatic finale of an imperial gown made entirely of filigree metal tiles linked together to create a floor-length number. Hands down to both of them! To be honest, I’m still having a hard time wrapping my head around the fact that I was actually in Philippine Fashion Week, it all really just feels like a dream now. I probably wouldn't believe it if I didn't have all these pictures stored on my laptop and I could probably continue to ramble on about each and every little thing I did each day, but that's not what I found most important about this experience. At the root of it all, being in PhFW inspired me. It gave me a whole new outlook, and reminded me of why I love fashion and why I am a fashion-blogger. 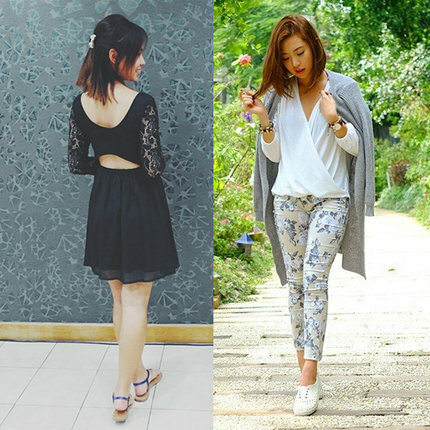 To read more about my experience, check out my Blog and follow me on Clozette, Instagram, and Twitter. Trust us. Nothing gets more intimidating than getting ready to attend a fashion show! It’s crucial to not over-do it, but it’s also important to not feel under-dressed as well! 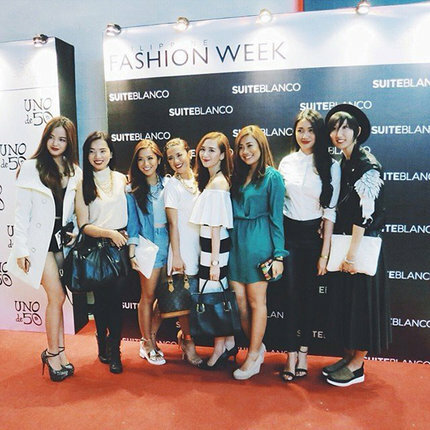 Last weekend, we invited 2 of our lovely Clozette Ambassadors – Crystal & Fenny to attend Pauline Ning’s show at Digital Fashion Week 2014 along with GlamAsia’s very own Editor, Smita DeSouza. Watch the video and take a peek into their Digital Fashion Week experience complete with a hair and makeup makeover! Why we love this look: This is so Fenny! A simple LBD paired with those killer booties! Also, check out that cut out at the back of her dress! Why we love this look: Crystal sure loves her colours; and so do we! 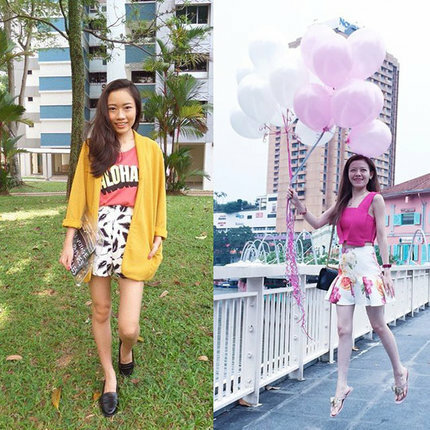 She’s totally rocking her H2T – from her hair down to that gorgeous electric blue shoes! 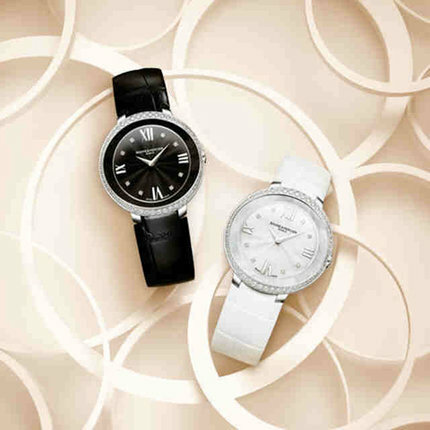 Why we love this look: Being fashionable does not mean you need a ballroom gown and a 9-inch platform heels to go with! Smita paired a black lace top with a casual pants and glammed it up with a pair of strapped heels. And a special thanks Digital Fashion Week for the experience!